The Rebecca Riots against road tolls are perhaps the best known part of Wales' radical history. But Before Rebecca lays out how the economic development of the principality saw a series of radical challenges to authority and struggles against poverty, hunger and over wages which set the scene for the better known struggle. 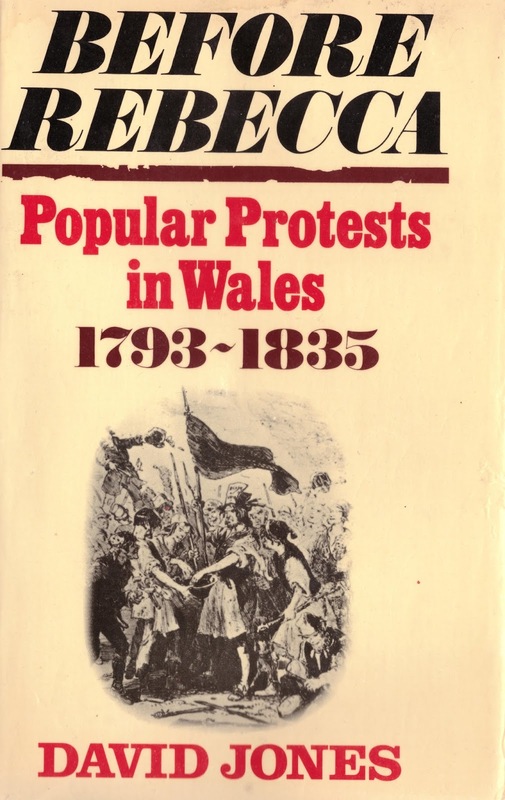 Historian David Jones' 1973 classic is a readable account of these conflicts which span the period from when Wales was basically an agricultural society to the development of the first major industry around Cardiff and Swansea in the first decades of the 19th century. Students of British working class history will see many similarities between Wales and England. The mid-1790s saw powerful and sustained food riots which, as EP Thompson, emphasises show more than a simple rebellion against high food prices, but also the development of a moral economy as communities fought against the free-market in food, setting their own prices or forcing traders and shop keepers to sell at a "moral" price. But the core of the book is the story of the riots, strikes and mass protests that were associated with the development of the coal and iron industries. 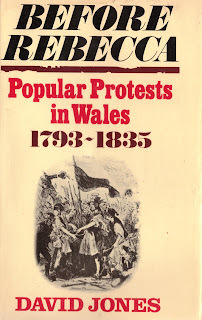 On several occasions these became major struggles that required local authorities to request military assistance, and as Jones explains, in June 1831 thousands of workers marched under a red flag to protest conditions in the industrial town of Merthyr. One June 2nd, a group of soldiers from the Highland found themselves surrounded and when the crowd tried to seize their weapons, they opened fire killing many and injuring dozens. The rioters proceeded to take control of the town and keep out reinforcements. Jones argues that while unsuccessful, the "rising" was part of shaping a working class radical tradition in South Wales that lasted long into the next century. Despite the scale of the Merthyr massacre it is barely known outside of the region, yet deserves to be remembered alongside Peterloo. Jones tells excellent history and has an eye for amusing and inspiring anecdotes. Although there was much discontent in [Carmarthen in 1830], few of the leading inhabitants showed much interest in the problem of maintaining order. Only thirteen permanent constables had been appointed. The London police constable who had been sent to the town on a previous occasion, had not been given support and had died of drink. Some authorities complained bitterly that women did little or nothing to restrain the wild activities of their menfolk. The most troublesome rioters were often females, particularly country widows and single women who worked at the pits. Armed with sticks, pans, and expressive language, women in this and later decades [early 19th C] terrified bailiffs, enclosure officials, blacklegs and policemen. They were found in the front ranks of a crowd, taunting males with their lack of manhood. Even when they were not involved in disturbances their support was frequently implicit and appreciated. Nothing is more unjust, than to be inflamed against a market, because the general price of it is dear. One may suppose a particular tradesman dishonest in his avarice. A market is governed by such principles of mutual convenience between the buyer and the seller, that it cannot be fairly accused of artifice, or oppression. Your object was a reform of the market, - the act was plunder; - and the punishment is death. Thus Samuel Hill, James Luke and Aaron Williams had their "virtuous lives" ended for daring to challenge the supremacy of the free-market in their desperation to feed their families in the midst of hunger and poverty. I don't think I've ever read a clearer example of the way that the state organises to protect the interests of the ruling class. For this, and countless other examples, I highly recommend David Jones' brilliant history and look forward to finding more of his work.